This paper argues that we shouldn't expect the kind of accuracy we have come to expect from CCSD(T) for closed shell molecules, for open-shell molecules. I have a slightly different take on the data. But first it is fair to ask whether coupled-cluster is an appropriate standard for open shell systems in the first place because of spin-contamination (note there is also spin-contamination in ROHF- coupled-cluster). If you get significantly different answers for UHF- and ROHF-based calculations it is not clear which one is the most reliable. The first thing the paper shows - for 18 atoms and small open shell molecules - is that spin-contamination decreases by roughly an order of magnitude for each step in SCF > CCSD > CCSDT > CCSDTQ so that it is negligible for the latter. For most of the molecules the spin-contamination is also negligible for CCSDT. This is good to know. The authors go on to show that CCSD(T) is a worse approximation for CCSDT for open shell systems (see Figure 1) and that CCSD(T) is always a worse approximation to CCSDTQ than CCSDT for open shell systems, in contrast to closed shell systems. While that's true, the data also shows that the CCSDT correlation energy is closer to the CCSDTQ energy for open shell systems. In fact the the mean error in CCSD(T) correlation energies relative to CCSDTQ is actually lower for open shell systems (0.80, 0.70, and 0.57 kcal/mol for RHF-, UHF-, and ROHF-based calculations). So this is good news. One note of caution in all of this is that the study uses cc-pVTZ (understandable as CCSDTQ calculations are performed). It remains to be seen whether the conclusions are true for the CBS. On a related note Anacker, Tew, and Friedrich have recently presented an incremental scheme for estimating UHF-based CCSD(T) energies for larger systems. Seeking Extremes in Molecular Design: To What Extent May Two “Non-Bonded” Hydrogen Atoms be Squeezed in a Hydrocarbon? 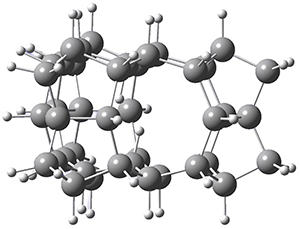 (1) Firouzi, R.; Shahbazian, S. "Seeking Extremes in Molecular Design: To What Extent May Two “Non-Bonded” Hydrogen Atoms be Squeezed in a Hydrocarbon?," ChemPhysChem 2016, 17, 51-54, DOI:10.1002/cphc.201501002. The resulting plots of the FOD for a series of test cases follow our notions of static correlation. Molecules, such as alkanes, simple aromatics, and concerted transition states show essentially no fractional orbital density. On the other hand, the FOD plot for ozone shows significant density spread over the entire molecule; the transition state for the cleavage of the terminal C-C bond in octane shows FOD at C1 and C2but not elsewhere; p-benzyne shows significant FOD at the two radical carbons, while the FOD is much smaller in m-benzyne and is negligible in o-benzyne. In a similar vein, Wegner and coworkers have examined the Z to E transition of azobenzene systems (1a-g→ 2a-g) using both experiment and computation.2 They excited the azobenzenes to the Z conformation and then monitored the rate for conversion to the E conformation. In addition they optimized the geometries of the two conformers and the transition state for their interconversion at both B3LYP/6-311G(d,p) and B3LYP-D3/6-311G(d,p). 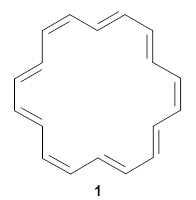 The optimized structure of the t-butyl-substituted system is shown in Figure 1. The trends in these barriers are not reproduced at B3LYP but are reproduced at B3LYP-D3. This suggests that dispersion is playing a role. In the Z conformations, the two phenyl groups are close together, and if appropriately substituted with bulky substituents, contrary to what might be traditionally thought, the steric bulk does not destabilize the Z form but actually serves to increase the dispersion stabilization between these groups. This leads to a higher barrier for conversion from the Z conformer to the Econformer with increasing steric bulk. (1) Wagner, J. P.; Schreiner, P. R. "London Dispersion in Molecular Chemistry—Reconsidering Steric Effects,"Angew. Chem. Int. Ed. 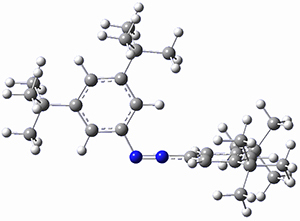 2015, 54, 12274-12296, DOI: 10.1002/anie.201503476. (2) Schweighauser, L.; Strauss, M. A.; Bellotto, S.; Wegner, H. A. "Attraction or Repulsion? 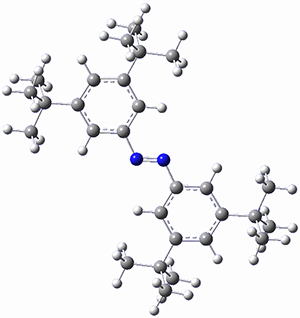 London Dispersion Forces Control Azobenzene Switches," Angew. Chem. Int. Ed. 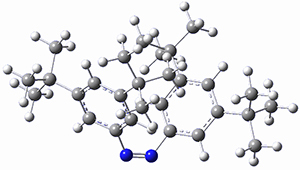 2015, 54, 13436-13439, DOI:10.1002/anie.201506126.